That is why vegetarian sushi never gets boring! I meet from time to time a person who is either vegetarian or vegan and I hear that they are a little challenged compared to finding sushi menus that contain vegetarian sushi that both tease the eyes and the taste buds. 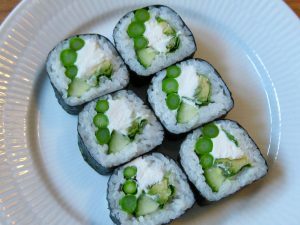 Vegetarian sushi is an underestimated dish. It abounds with various kinds of raw materials that are suitable for vegetarian sushi and here I am not just thinking about avocado and cucumber. In Europe, we are so fortunate that every season offers unique vegetarian ingredients that will suit any menu card when through various Japanese cooking techniques are transformed into delicate sushi pieces. However, several different Japanese cooking techniques must be used to conjure up the delights because the consistency of vegetarian ingredients is very different. At the vegetarian sushi course for beginners you learn to use various useful techniques for making delicious sushi rolls.